O’Toole’s name had appeared on a solely male list of speakers for a panel discussion on gender stereotypes. 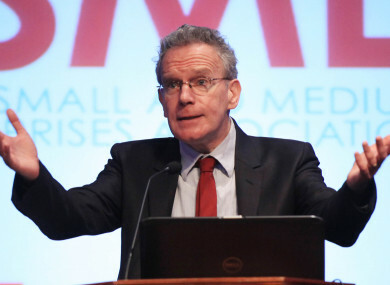 IRISH TIMES JOURNALIST Fintan O’Toole has said he will not be participating in any events at this year’s MacGill Summer School amid controversy over the lack of gender parity. The annual event has been criticised for having about 20% female representation in its panels. In response to the criticism, founder and organiser Joe Mulholland announced the school was to add two additional sessions. One will focus on the referendum on the Eighth Amendment. The other will discuss why MacGill and other public forums in Ireland have not effectively embraced gender balancing. This week a speaker list appeared on the school’s website for this session, entitled: ‘Women in Irish Public Life: Why are organisations such as the MacGill School still trapped in a world of gender stereotypes?’. Two names were included on the list – Irish Times journalist Fintan O’Toole and columnist Gerard Howlin. The solely male list noted that further speakers were to be announced. Mulholland told The Irish Times that this list appeared on the website because of a technical issue. He said the two men were due to be among the speakers for the original session in that slot and he did not have the technical know-how to remove their names on a temporary basis. However he said he did want O’Toole and Howlin to remain involved in the discussion. This morning, O’Toole tweeted that he would not be taking part in this event – or any event at MacGill this year. Mulholland was contacted by TheJournal.ie for comment this morning but he had not responded by time of publication. Email “'It's grotesque': Fintan O'Toole pulls out of MacGill Summer School event over gender balance controversy ”. Feedback on “'It's grotesque': Fintan O'Toole pulls out of MacGill Summer School event over gender balance controversy ”.